The balls used in Sunday's Super Bowl will be given "added security" amid the ongoing investigation into the NFL's 'deflate-gate' controversy. 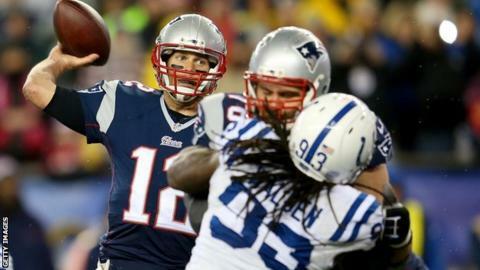 Finalists New England Patriots used under-inflated balls in their victory over Indianapolis Colts. Referee chief Dean Blandino said 108 balls will be used as the Patriots take on Seattle Seahawks in Arizona. "There will be some added security just because of the environment we're in for this game," said Blandino. During a regular game, each team has 12 balls which are given to the officials before the game to be inspected. But in the Super Bowl, because some of the footballs are later given to charity, each team has 54. All of the balls will be taken into custody by the NFL on Friday after the Seattle Seahawks and New England Patriots have prepared them. The footballs will be inspected by referee Bill Vinkovich three hours before the game, which takes place at the University of Phoenix Stadium. Blandino said the inspection of the footballs by referee Walt Anderson before New England's 45-7 win over the Colts was handled properly and the officiating is "not part of the investigation". "Everything was properly tested and marked before the game," added Blandino. "Walt gauged the footballs himself. It is something he has done throughout his career."